When it comes to bible journaling, you don’t need much. 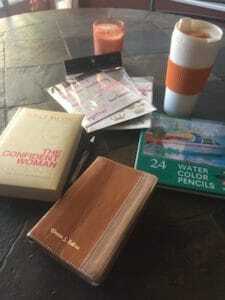 Start with a bible and a pen or pencil, and then add from there if you’d like. We love bible journaling and thought we’d save you some time and money by listing our favorite bible journaling supplies. From Bible journals to pencils, everything we have here we’ve tried and recommend. Not sure where to start? Before buying anything, you should consider taking our free 10-day Bible journaling course. No credit card needed! 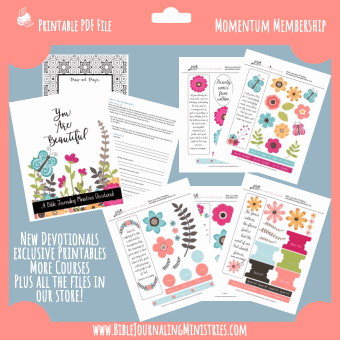 The best deal that you’ll find on faith-based Bible journaling supplies is with our Momentum program. To learn more about that program click here. You can also find amazing printables in our store. Interested in cutting out your own stickers? Here’s a guide to help you if you already have a machine: How to Print and Cut Your Own Stickers. Tracie prefers the Silhouette Cameo. She also has the Brother, which has the ability to scan and cut without the need for a computer. We love digital images because they’re usually free or very inexpensive, plus they’re super easy to store on the computer, print out on transparencies, or filed in a binder. We find that the best bible journaling supplies are portable. The easier you make it the easier it is to grab and go when inspiration strikes you. That’s why we focus on providing resources and templates for you to use as you journal. You can find discounted bible journaling supplies at your local Dollar Tree, Target, thrift store, Tuesday Morning, and with a coupon from Michaels, JoAnns, and Hobby Lobby. Bible journaling supplies should be easy to grab and go. eBay, Craigslist, yard sales, and your community Facebook groups are a perfect place to find gently used supplies as well. If you’re buying online, try using Ebates to get a rebate on anything you purchase. If you’re new to Ebates, here’s our referral link for a $10 gift card after you’re first purchase. Consider getting a group together for a swap or ask your friends if they have any they want to get rid of. You never know what you’ll get if you just ask. Bible journaling doesn’t have to be expensive. It’s better to start now rather than wait until you can afford “all of the things”. Take the first step by grabbing what you have on hand and giving it awhirl. When the time is right, then splurge on something that makes you happy and provides joy to your journey. Remember that when you purchase bible journaling supplies using the links on this page helps support our ministry. Thank you so much!